Overview – The McKesson Protective Underwear Ultra is for moderate to heavy absorbency. It is a unisex pull on product for either men or women. The pull on style gives you the easy on/off as would your normal underwear. The waist is stretchable for comfort and fit. The core features a high quality acquisition layer that absorbs fluids quickly. This reduces the pH in the urine for healthier skin. This makes the core a dual performer by locking away wetness from the skin and reducing odor. It also features leg cuffs or gathers at the leg openings for better leakage control. This product is very discreet and comfortable. Absorption – This product is designed for those needing moderate to heavy absorbency. The dual core quickly wicks any fluids away from the skin and neutralizes the pH to reduce odor at the same time. Fit – The McKesson Protective Underwear Ultra features a stretchable waist band for comfort and fit. The leg cuffs or gathered leg openings help prevent leakage. Odor Reduction – This is done with the dual performing core. The fluids are quickly absorbed and the pH neutralized. Additional Products – If additional coverage is needed, you can add booster pads. These pads add to the capacity of the product. Or you can move up to the next coverage level. Some people use a cover up for added peace of mind. This is to help prevent leakage. Suggestions Alternatives - Style and Also Bowel – While this product sizing is available in youth and bariatric sizes, some may want to try a different product. An alternative would be the McKesson Absorbent Underwear – Regular Absorbency. 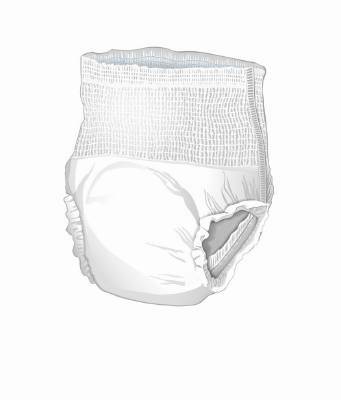 An adult diaper with tabs that is similar to the McKesson Protective Underwear Ultra is the McKesson Ultra Tab Closure Brief. For those needing bowel incontinence coverage a good alternative would be the Tena Discreet Protectve Underwear. There are only a few pullup style products available for bowel incontinence, that Tena product is one of them. Note that the McKesson Protective Underwear Ultras are the least expensive and all products in the above table and are for moderate urinary incontinence. The Tranquility Comfort Care Underwear do have some Tranquility features that the McKessons don't. What is the good and bad of the pull on style. The pull on style is the closest to your regular underwear. It tends to be where most people go to first. It is an easy transition for them to go from their normal underwear to the pull on style diaper. The one bad side of the pull on style is, that just like your normal underwear, when you need to change the product you will need to undress from the waist down. For some this is inconvenient. Will these be more absorbent with less leakage than a pad in my normal underwear? This product is designed for those with moderate to heavy incontinence. It will probably have a higher capacity than the pad you are using within your normal underwear. Having a difficult time getting the wearer to use this type of product, any suggestions? As long as you can reason with the wearer – show them how they are so close to being normal underwear. This is why the pull on style is so popular. For most, it will be all they need to at least try the product. Once they try the product and experience the dry feeling (no accidents and no wet bedding) it makes the transition easier. I bought the store brand because it was cheaper but it doesn’t work, why? With incontinence products you get what you pay for. The product you bought evidently does not have the capacity that you require. Or you may have bought the wrong size. Check the sizing and what level protection it is supposed to give. A better quality product, at the right size and capacity, will be a plus all the way around. I have both urinary and bowel incontinence, is there product for me? Yes, there is product for both urinary and bowel incontinence. People do not realize that with bowel incontinence you really should be using specific product that is designed for that need. The cores are generally longer and have a wider span at the back of the product. Some products actually have pockets at the back area for containment. For a really fantastic product that covers Urinary and Bowel both, try the Tranquility Smartcores. For something a little less expensive but not as robust, you can also try the Prevail Extra Protective Underwear. About McKesson– McKesson brand has been around since 1833. They provide the industry with the resources, support and technology needed to create new standards and a better health world. 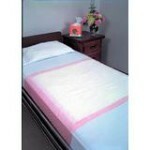 They provide a good quality product at a reasonable price for the people who need incontinence supplies. They also have other products from gloves to hospital furnishings. Great absorbing protection. Fit is comfortable, nothing stiff or scratchy. Terrific price here! My husband uses these at night. He had ended up taking others off in the middle of the night because they were uncomfortable. These are comfortable and a good fit, He will continue to use them. I finally found the fit I needed. Softer than others on the market, with better elastic in the legs, makes for the better fit. For the record, I chose to go with McKesson because I was familiar with the company through my former employer. I placed regular orders on behalf of two different companies and found your staff and products to be helpful and reliable. This whole incontinence thing came on quickly and so far I am pleased with your product, I barely notice the difference from regular underwear. I have been alternating them with a pad but the pad seems to leak and are so uncomfortable. With your product I know that I'll have time to make it to the bathroom without any embarrassing leakage.